Modern and refurbished ice arena in Queenstown. Excellent facilities, cafe, lounge, big screen TV. Skating hire, hockey hire, and late night Friday night skating. Family passes available. 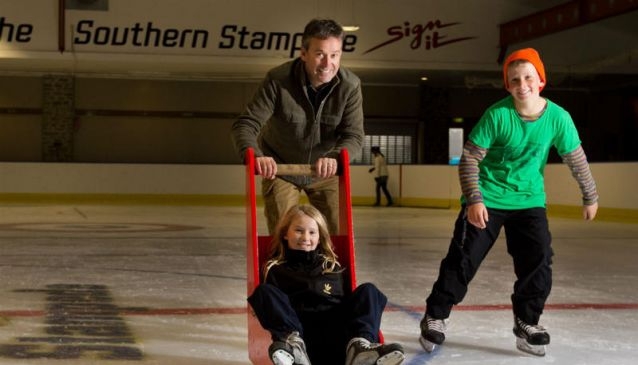 If you're looking for an awesome day out that's just a little bit different, slide on down to the Queenstown Ice Arena. It's located in the landmark Queenstown Gardens, just a short hop from the centre of town. After recent, extensive renovations, this international-standard arena is the perfect place to stage ice hockey, curling and figure skating, and makes the ideal venue for recreational use. You can grab a delicious bite to eat in the alpine cafe and lounge, cooked by their very own chef. Refuel in the comfort and warmth of your surroundings, maybe watch a movie on the big screen TV, or get competitive with the selection of video games. Why not sign up for some hockey or skating lessons from experienced professionals. There are group and individual rates to suit all-comers. You can hire anything you need, from premium skates, sticks and skating aids, to ice sleds and hockey equipment. The safety helmets are provided free of charge. Enjoy a specially-extended Friday night, with the romantic night-time skating (phone confirmation advisable). Monday 10am-5.30pm, Tuesday 10am-4pm, Wednesday 10am-5.30pm, Thursday 10am-4pm, Friday 10am-10pm, Saturday 10am-10pm, Sunday 10am-4pm. Friday Night Lights: 6pm -10pm / Retro Night every Saturday 6pm - 10pm.